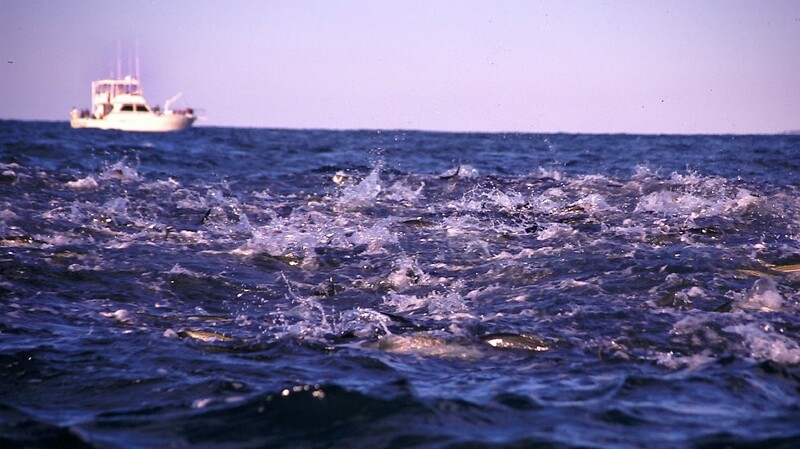 This photo and top: menhaden off Montauk, NY. Photos by John McMurray. Managers fire off such acronyms regularly at hearings and public meetings. The truth is that unless you are a career marine biologist, fishery manager or industry lobbyist, it’s damn hard to understand any of it. Sometimes, at fisheries management meetings it almost seems like folks are speaking in a different language. And so good on The Fisherman Magazine for cutting and pasting a lot of that stuff, and putting it out to anglers so that it’s right in front of them. But I’m not so sure that was the intent. Because toward the end, we get the gratuitous editorial you often see in this particular editor’s writing… In this case, discrediting what he incorrectly describes as an attempt to create new terms and statutory definitions by, gasp, environmental groups. Second, I’m fairly certain no one is trying to manufacture a “mealy-mouthed” statutory definition of abundance. I want to note here that the author also mocks the term “experience” because I want to touch on that also. 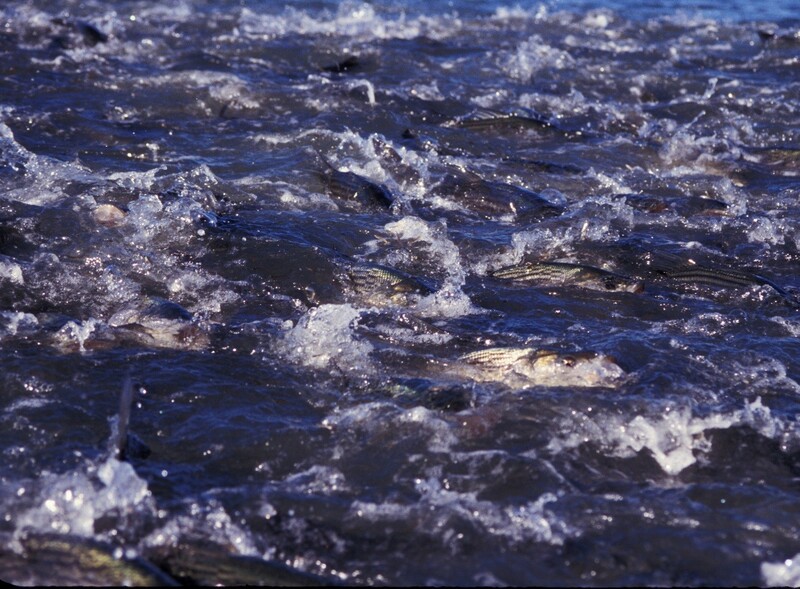 Abundance in action: menhaden off Montauk, NY. Let’s be clear about one thing here. The idea of moving away from managing for maximum sustainable yield – taking as much out of the stock as possible while still allowing it to replenish itself – and instead managing for “abundance,” which fundamentally enhances the recreational “experience,” is not some “new” environmentalist or fly-fisherman conspiracy. The recreational community has been promoting it for decades. Taken as a whole, anglers are not particularly good fisherman. We don’t use nets, longlines, traps, etc. ; we use rod and reel. That may be the most “sporting” and enjoyable method and the one that enhances “experience,” but it is also the least effective. That becomes even more true when you consider the saltwater fly-fishing and light-tackle stuff that the author ridicules here. And how about the surf casters… those folks constrained to fishing from the shore? It is no coincidence that these parts of the recreational fishing community tend to be the most conservation-minded, and it’s precisely why I feel the author belittles them here. I do get it… Precautionary management and the sort of “abundance” that it brings, probably isn’t great for the commercial fleet because it constrains catch, and to some extent, hurts commercial harvesters’ bottom lines. It’s also not great for some charter/party boat operations who fish every day, and are pretty good at finding/catching fish on a regular basis, even when stocks are at low levels. And some of those operations choose to market their trips as a chance to fill coolers instead of simply enjoying the “experience” of fishing. But for the rest of us? The light-tackle guide, the weekend angler, the guy who fishes from shore, not to mention those saltwater fly-fishers, well, precautionary management and abundance is a good thing because it gives us access and opportunity. In that context managing for abundance would seem to make sense, and when explained, most anglers understand that managing for abundance benefits them. Unfortunately, as I’ve said before, such anglers are likely a “silent majority.” These are the people who fish just to have fun and don’t want to get involved in the often contentious and always difficult-to-understand management process. And I don’t blame them! Yet because this is the case, those angler’s voices get hijacked by the “professional” crowd – the industry groups, the charter/party guys, the paid lobbyists – all of the people whose financial success depends on killing as many fish as they can now, and not necessarily on abundance, opportunity and experience. It’s not unreasonable to believe that the “silent majority” wants fisheries managed for abundance. Frankly, I don’t like that The Fisherman Magazine printed an op-ed that makes fun of that silent majority. Sure, light-tackle charter boat captains make more money when they can put clients on fish with light-tackle or fly gear. But it’s more than that… “Abundance” means we can take our kids out at noon, and we can actually find and catch things like scup, black seabass, fluke and bluefish. We can’t keep most of them, and that’s fine. Because despite how much the author of that piece makes fun of the word “experience,” that’s what’s important about those family trips. It sure as hell ain’t about filling coolers. Of course, the usual cast of characters will try and label anyone who believes in managing fisheries for abundance as a “tree-hugger.” But let’s be crystal clear about another thing here… Most of us don’t even like trees! The only reason we’re involved in all of this… the only reason most of us have ever really cared is so we can ensure that there are enough fish in the water so that we can find, play with and/or kill them. That sure doesn’t make any of us tree huggers. We certainly do understand the arguments for “reasonable access.” Yet I believe that such access is exactly the outcome of managing for abundance. I can’t speak for red snapper as it’s not in my region, but I would certainly argue that a 120-day fluke season and three fish at 19″ is “reasonable,” especially since it keeps a few fish in the water for the rest of us when it’s clear the stock has had six years of poor recruitment. I’m not going to argue here that the current law – the Magnuson-Stevens Act – is perfect. In fact, it may stand to be “tweaked” in a few places. And reasonable people are beginning to work together on a compromise reauthorization bill. But in the overall context of managing for abundance, the Magnuson-Stevens Act serves anglers comparatively well. To put it simply, the alternative is being able to kill more now, but having fewer fish left in the water for us to access. I’m not really down with that, nor do I believe most anglers are.